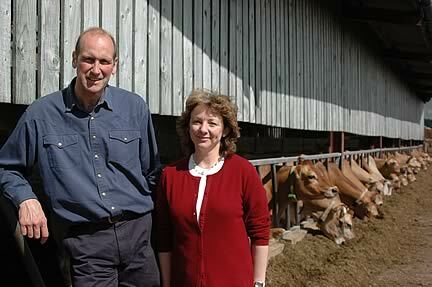 Ian Macalpine is the newly elected chairman of the Royal Association of British Dairy Farmers. He succeeds David Cotton who has completed a three year term of office. Ian has been dairy farming for over 30 years, previously with Holstein Friesians, and now in partnership with his wife, Sally managing a 250 cow pedigree Jersey herd near Clitheroe, Lancashire. Their 196 acre grassland unit features a zero grazing system. During his term of office, he says he is looking forward to responding to the challenges the industry faces and representing the RABDF, the only industry organisation dedicated to working solely for British Dairy Farmers. “I plan to make an active contribution to the Dairy Coalition whose current focus is towards all processors agreeing to the voluntary code and its subsequent implementation along with achieving a fair milk price for all producers,” he explains. Newly elected RABDF vice chairman is Derrick Davies who farms near Reading where he manages two estates with 300 milking cows.